Tariq Mehmood is an award winning novelist and documentary film-maker. His first novel, Hand On the Sun, was published in 1983 by Penguin (London). His second novel While There Is Light, was published by Comma, 2003. In 2015 he published, his award winning novel, You’re Not Proper, a story of two girls struggling in a town seething with Islamophobia, was published in March 2015 by Hope Road (London). His latest novel, Song of Gulzarina, published by Daraja, Montreal, 2016, is the story of a 77 year old Pakistani atheist who plans a suicide bombing in Manchester. Tariq is the co-director of the multiple award-winning documentary Injustice, a story about people who have died in British police custody. He teaches at the American University of Beirut (AUB), Lebanon. You’re Not Proper: Karen thinks she’s not proper white. Her dad is Pakistani and her mother is white Christian, and somehow she feels as if she doesn’t quite fit in… anywhere. So she’s made a choice: she’s switching sides. She’s going to convert to Islam to find her true identity. But Shamshad, her Hijab-wearing school mate, isn’t making things easy for her. What’s her deal, anyway? Is Shamshad really any more ‘proper’ than Karen is? 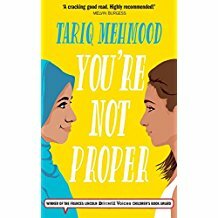 Set against a backdrop of seething prejudice, You’re NotProper goes deep into the world of Muslim youth, challenging their increasingly notorious and popularly held association with ‘Allah-o-Akber-ers’. This novel takes us into a Britain in which people can no longer have a single identity, if ever they had one. Who belongs where, and who is proper in what place or in which circumstance are some of the major themes of this novel. And what happens to young people when all they hold dear is snatched away, sometimes violently, due to events and forces thousands of miles away? The Song of Gulzarina: A suicide bombing is being planned in Manchester, UK. Behind it lie Saleem Khan’s vivid memories – some full of regret and yearning, others humorous and yet others overshadowed by the surreal brutality of the war. In the 60s, he leaves his lover, his job as a teacher and his home in the rural Pakistan and travels to Bradford, a town seething with racism where Asians are ‘Pakis’ and their labour is cheap. He finds a job working in a mill on an all-Asian night-shift, becomes an active trade unionist and when the mills close down, he drives a taxi. He gives up his religion and eventually falls in love with an English woman. But in the 1980s Pakistan draws him back. Now regarded as a smart ‘abroadi’, he gets involved as the English-speaking partner in his cousin’s transport business. When a truck driver he knows, does not return to base, he sets out to find him and unwittingly gets drawn across the border and into the killing fields of Afghanistan. Here, among Russian soldiers, Saudi Arabian Sheikhs, American Pirs, prostitutes and the holy warriors of the Mujahadeen, who take their orders and weapons from the United States, he meets Gulzarina, the woman whose life and experiences in a war without end allow him to finally make sense of his own.